Bacteria use an impressive arsenal of secretion systems (1-7) to infect their host cells by exporting proteins, DNA and DNA-protein complexes via cell membranes. They use chaperone-usher pathways for host colonization as well. To be targeted for transportation across one (Gram-positive) or two membranes (Gram-negative), clients must be selected, guided and unfolded to pass through type 3 (T3SS) or type 4 (T4SS) secretion systems. For these processes, bacteria count on secretory chaperones that guide macromolecular transport via membranes. Moreover, if we know how these processes occur, we might be able to stop them and avoid bacterial infections. Thus, structural and functional characterizations of secretory chaperones become interesting, as these proteins are the perfect targets for blocking bacteria action. 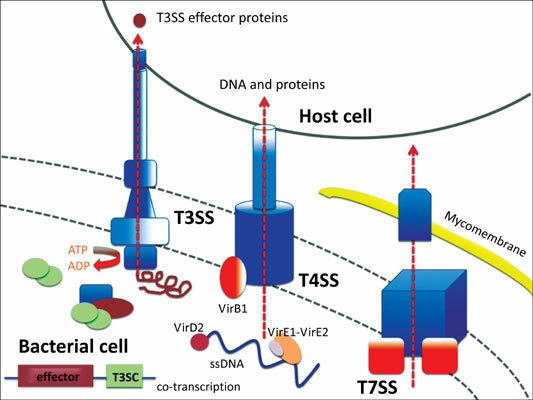 Therefore, this review focuses on a story of known mechanisms of chaperone- secretion assisted transport with special attention on virulence proteins and DNA transport in bacteria. Bacteria, secretion systems, secretory chaperones, chaperone-assisted secretion, protein, secretion.